Annual income is the total earnings within a one year period for a person or a business. It is common to mention the annual income on job vacancy ads and on business reports. When speaking about annual income it is important to make the correct distinction. There are two types of annual income. These are gross annual income and net annual income. Gross annual income is the amount of money earned before any deductions. For an employee, gross annual income includes wages, bonuses, tips and any other financial incentives. Gross income for an employee is also called gross pay. For a business gross annual income is the total revenue per annum before the costs and other deductions are calculated for. Net annual income is the amount of money earned after all the deductions have been made. In the case of an employee, the net annual income is found by deducting all taxes and other fees to be paid from the gross annual income. This is also called net pay. Net annual income for a business has already factored in taxes, production costs and other costs associated with running the business. The following are examples of how to calculate annual income for either an employee or a business. The above figure is an example of how to calculate annual income based on an employee’s wages over different time periods. If the hourly wage is known then multiply that figure by 2000. 2000 is the average number of working hours within a year. If the employee works for a daily wage then multiply the daily wage by 250. You may have noticed that this figure is not the answer to 5 working days per week x total number of weeks in a year. That would be 260. 250 already accounts for the average of 10 days of leave within a year. If the employee has a weekly pay then multiply this figure by 50. Again, this figure already accounts for the 10 days or 2 weeks of leave per year. Alternatively, you can multiply by 52, depending on which is applicable to the situation. If the monthly salary is known then multiply this figure by 12. Some businesses will offer a bonus of a 13th month. In that case, the monthly salary can be multiplied by 13. It is also possible to calculate backwards from the annual income. Simply divide the annual income by the appropriate denominator. For example, to calculate the hourly wage from annual income, divide the annual income by 2000 (hours). The above calculations can be made using both the gross income and net income figures. The annual income for a business is the same as its revenue in one year. Though it is possible to calculate a business’ annual income by adding its daily, weekly or monthly revenue, it is more tricky to break down the annual income figure. This is because a business’ revenue fluctuates more than a person’s salary. An employee earns regular wages while a business’ income depends on the market and corporate strategy. If the gross annual income figure is known, then it is possible to calculate accurately the net annual income of a business. 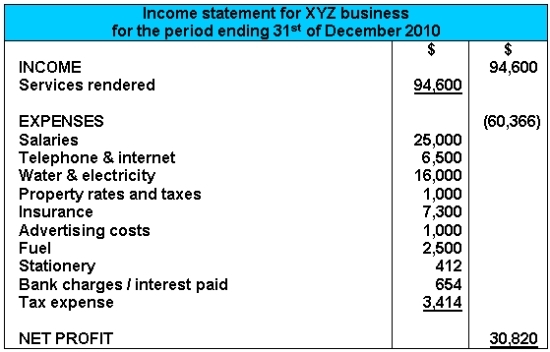 The figure below is an example of how the net annual income of a business is calculated from its gross annual income. Below is an example of a business’ income statement. 1. Anna’s gross annual income is $45,000. What is her hourly wage if she works an average of 40 hours a week? 2. Refer to the example in question 1. How do you calculate for Anna’s annual net income? A. Anna’s annual net income is her gross annual income divided by 12. B. Anna’s annual net income is the same as her weekly income multiplied by 50 weeks. C. Anna’s net annual income is her gross annual income subtracted by all the applicable deductions. 3. Which of the following statements is the most precise? A. Annual income is how much an employee earns per year after taxes. B. Annual income of a business is the same as its revenue after productions costs have been subtracted. C. Annual income is the total earnings of an employee or business within a period of one year.